Change Management - Innovative Growth Solutions, Inc. Organizational change presents both significant challenges as well as opportunities for growth and creativity. Managed proactively, change processes enable organizations to re-align business processes with strategic priorities and staff energized to deliver quality outcomes for customers. 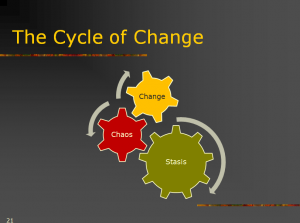 IGS is well prepared to assist organizations to develop effective tools to anticipate and manage organizational change. We work with organizational leaders to clearly define and articulate the desired change and to build leadership skills and processes to facilitate the transition. We help leaders define a clear road map to implement change and help them to understand and manage the human dynamics of change. Building trust through effective communication. Following is an example of a change initiative approach developed and implemented for a public agency division of over 400 staff undergoing a significant reorganization. IGS meets with the Organization Director to identify the staff most affected by the reorganization and the managers who supervise them. IGS then conducts an interview process with managers designed to help them express their concerns around the change process and gives them an opportunity to explore how they as managers, can assist their staff through change. To insure that staff is heard and has the opportunity to express concerns, IGS conducts one-on-one interviews with staff most affected by the reorganization, and subsequently conducts a workshop designed to build team unity and address concerns around the change process. Based on interviews and information gathered from the Director, IGS creates agendas for teambuilding retreats and meets with the Director to finalize the retreat outcomes and agenda. IGS conducts retreats targeted at the specific needs of the group. Following the retreats, IGS meets with the Director to evaluate the teambuilding process and to identify recommended next steps in the Team’s development. In order to keep the team moving forward during the reorganization, IGS meets with the team monthly for approximately 6 months to discuss what is going well and to identify challenges in navigating the change process. To this end, IGS conducts monthly coaching sessions with the management team and staff to discuss support and barriers to implementing the change. Each session concludes with action steps designed to keep the team moving in a positive direction. Approximately six months to a year into the reorganization, IGS meets with the Director and management team to gain perspectives on successes, challenges and gaps in the implementation of the reorganization. IGS then conducts interviews with individual departmental managers to discuss specific needs for their teams. Based on the report generated from these interviews, IGS custom designs team building programs customized to meet the unique needs of each department. After all departments complete individual programs, IGS plans a retreat to bring the division together to evaluate the implementation of the change initiative and celebrate successes. IGS has provided facilitation services to many governmental and non-profit agencies including Portland Development Commission, Portland Community College, City of Portland, Clackamas County, Children’s Nursing Specialties, Tillamook County, Oregon Department of Transportation, Oregon Commission on Children and Families and The Oregon Advocacy Commission. IGS is able to facilitate one-time meetings as well as highly complex organization-wide change initiatives.